Geography is always discounted at Schoolhouse Publishing! Geography is such a fascinating subject. I love learning about other countries, customs, foods, clothing, homes, beliefs and governments. 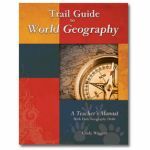 For great, discounted homeschool geography curriculum, check out the selections in this section of our website. When working on geography, teaching with activities and projects is one of the reasons I love this subjects! Geography lends itself to this kind of fun! The resources here will take your geography program and help it to come alive. It's as easy as cooking an ethnic dish or trying your hand at an art project from another country. Even easier, play a game, or put together a puzzle. Check through these resources for some fun ideas. These also make great gift ideas (just pass your wish list on to the grandparents). Spark your geography,and save money at the same time.